L’acteur Liam Neeson et le gouvernement irlandais lancent les commémorations de 1916 aux USA. Le ministre des affaires étrangères d’Irlande, Charlie Flanagan, inaugure le centenaire du soulèvement de Pâques 1916 lors d’une réception officielle aux USA. The US commemoration of Ireland’s 1916 Easter Rising was launched yesterday in New York by Irish Minister for Foreign Affairs Charlie Flanagan, Ambassador Anne Anderson, and leading figures from the Irish and American communities including writer Colum McCann, Senator Chuck Schumer, singer Maxine Linehan, Irish tenor Antony Kearns, and actor Liam Neeson. Ireland 2016 will consist of a year-long program of over 200 events across the country, exploring the history of Easter Week 1916 and forming a larger celebration of the shared history and enduring bond between Ireland and America. 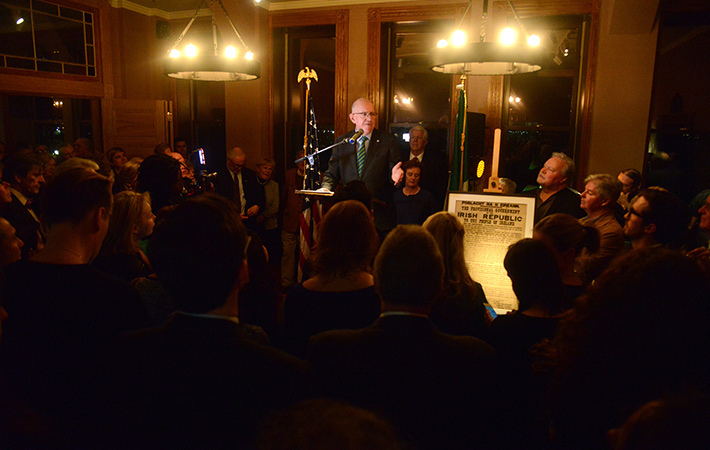 At the Irish Consulate in New York and, later, at Pier A Harbor House (the spot where thousands of immigrants arrived in New York city from Ellis Island; recently rehabilitated as a venue by Irishman Danny McDonald), the Irish American community gathered to mark the start of the 1916 centenary and to learn what the coming year has in store. “This is a highly significant year in Ireland and for Irish people across the globe. There’s no other small country with such a hugely engaged diaspora as Ireland,” Minister Flanagan told IrishCentral. Five of the seven Irishmen who signed the Proclamation of the Irish Republic had spent significant time in the US before the Rising, and one of them, Thomas Clarke, was even a naturalized American citizen. America also holds the distinction of being the only foreign country to be mentioned by name in the Proclamation, which, Flanagan added, was itself inspired by the American Declaration of Independence. The year of Ireland 2016 events across the Unites States was organized by the Irish Embassy and the six consulates general in New York, Boston, Chicago, Atlanta, Austin and San Francisco, which worked closely with partners in the federal and local governments, with key cultural institutions and leading academic institutions, as well as many Irish community groups. Rather than simply focusing on New York, Boston and other American cities with the strongest historic links to the Rising, the 2016 program of events will be spread out across country, offering the larger Irish diaspora in America an array of cultural, community and educational events. I am Ireland, an initiative led by Culture Ireland, will bring even more Irish art and culture to the US in the year ahead. The centerpiece of the 2016 celebrations will be Ireland 100, a three week festival of Irish arts and culture from May 17 to June 5 at the Kennedy Center in Washington DC featuring some of Ireland’s best known and most exciting artists, including actress Fiona Shaw, The Abbey Theater, dancer Jean Butler, musical group The Gloaming, and writers Colum McCann, Anne Enright and Colm Toibin. Another cornerstone of the program will be “1916: The Irish Rebellion,” a feature documentary on the Rising produced by the University of Notre Dame. 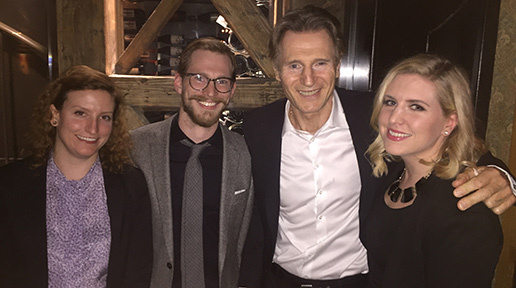 The documentary is Liam Neeson, who attended yesterday’s launch at Pier A. It is set to air on PBS and will be screened in various venues across the US. On the subject of criticism that the global events for the 1916 centenary have been too politically correct in their inclusiveness of British commemoration, he said it was important to acknowledge the past with an eye to the future. “In our decade of centenaries we reflect on what is the rich tapestry of Ireland and Irish politics. The years of 1920 – 1922 were particularly turbulent, and it’s important we recognize that and we reflect on the events, but it’s also important that we do so in a way that commemorates our past 100 years and that we also look to the future of a political climate on the island of Ireland, particularly with our nearest and closest neighbor, the United Kingdom,” He said. Irish Ambassador to the US Anne Anderson also expressed hope for the impact of the Ireland 2016 program. “When these centenary events draw to a close, I hope we will look back on a year that has raised Ireland’s profile in America, that has educated us and animated us, challenged us and illuminated the path forward,” she said. “I love the way that Americans, as they confront choices and challenges, reach for that affirmation. ‘This is who we are.’ It does not suggest a perfect America, it does not erase the flaws or the errors, but it summons what is best and truest in America, the generous-spirited, open-hearted land of opportunity,” she said. L’acteur irlandais Liam Neeson entouré de l’équipe de Irish Central et de l’Irish American Magazine. Cette entrée a été publiée dans Ireland 1916-2016, Irlande 2016, et marquée avec Irlande 2016, Pâques 1916, USA, le 9 janvier 2016 par irlande2016.